Save Big Money on Your Wireless Bill While Traveling! Let's face it - the wireless carriers know they've got us between a rock and a hard place when we travel to a foreign country. We want to bring our iPhones along on our trips, but international roaming fees can add hundreds of dollars to our wireless bills if we're not careful! Hello, my name is Marcel Brown and I'm a professional technology consultant. I faced this exact problem while traveling a little over a year ago and I was not about to pay the exorbitant fees my carrier wanted to charge me. So I figured out how to avoid those charges and now I want to share my findings with you. 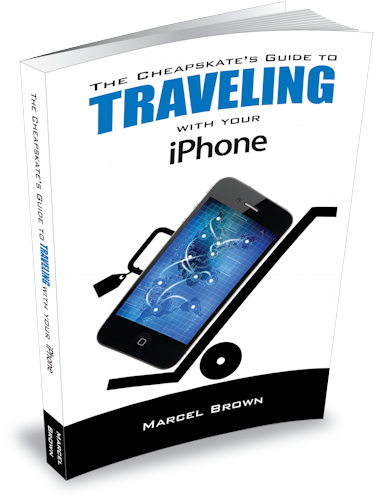 The Cheapskate's Guide to Traveling With Your iPhone, details how you can bring your iPhone along on your vacations and use it to your heart's content - all while not spending a penny extra on your wireless bill! Known as The Most Trusted Name in Technology, Marcel Brown is a technology professional who has over 20 years of industry experience, plus a lifetime love of technology. Having run an independent technology consulting practice for over 13 years, Marcel works primarily with small businesses, professionals, and individuals.